Former Secretary of State Hillary Rodham Clinton said Thursday she will focus much of her attention on issues promoting early childhood development, women and children and economic issues as part of the foundation created by her husband, former President Bill Clinton. The potential 2016 White House contender offered her most extensive description of her post-Obama administration agenda since leaving her role as the nation's top diplomat. 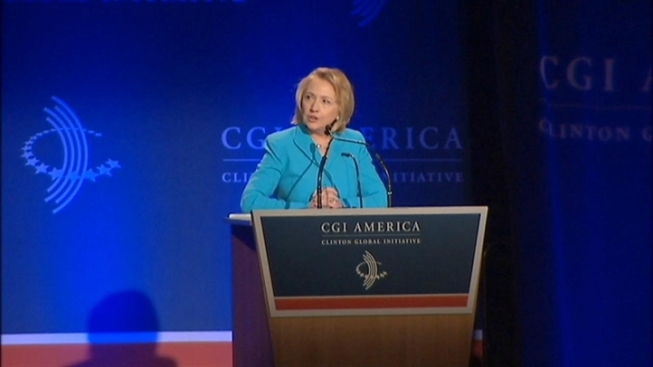 Clinton walked out to applause on stage at a Clinton Global Initiative America meeting in Chicago, calling the Clinton Foundation "my home" for several new public policy initiatives close to her heart. "What I think we have to be about is working together, overcoming the lines that divide us, this partisan, cultural, geographic (divide)," she said. "Building on what we know works, we can take on any challenge we confront." Clinton's speech at the start of a two-day conference touched on themes that could be part of a future Democratic presidential campaign, with the former New York senator stressing the need for private and public partnerships to tackle issues like economic and educational inequality. "This can't just be a conversation about Washington. We all need to do our part," Clinton said. The foundation has recently been renamed the Bill, Hillary and Chelsea Clinton Foundation to reflect the family's full involvement in projects around the globe. Clinton noted that she had visited 112 nations as President Barack Obama's secretary of state — "I'm still jet-lagged," she joked — and had learned several lessons during her travels around the world. Regardless of someone's circumstances or homeland, "what people wanted was a good job," she said. She also pointed to efforts in rural West Virginia to boost education and overcome poverty, saying economic inequality was "not limited to one county in West Virginia." "There are too many places in our own country where community institutions are crumbling, social and public health indicators are cratering and jobs are coming apart and communities face the consequences," she said. As secretary of state, Clinton promoted a number of initiatives to improve the standing of women and girls in developing nations and she said that focus would continue, both in the United States and abroad. Clinton also described efforts to bolster early childhood opportunities around the nation, a subject that Obama has pushed this year. The founder of the initiative, Bill Clinton, said he was glad his spouse was joining him at the foundation "with her own priorities and projects." The former president said he learned everything about non-governmental organization work from his spouse, who worked early in her career with the Children's Defense Fund and was active on a number of educational and health initiatives as first lady of Arkansas. Mrs. Clinton's remarks focused on the initiatives she'll be pursuing at the foundation and did not address recent criticism from Republicans over her handling of the deadly attack on Americans in Benghazi, Libya, last September. She did not address a recent report that said misconduct complaints against American diplomats were improperly halted by senior State Department officials while she was at the State Department. The State Department's internal watchdog has asked outside law enforcement experts to review the cases. The conference included sessions led by the former president; the couple's daughter, Chelsea; Treasury Secretary Jack Lew and actress Eva Longoria. New Jersey Republican Gov. Chris Christie, a potential 2016 White House contender, was joining the former president on stage Friday for a session entitled "Cooperation and Collaboration: A Conversation on Leadership," a nod to Christie's embrace of a bipartisan mantle as he seeks re-election in his Democratic-leaning home state this year. For the former first lady, who grew up in suburban Chicago, the speech served as one of her most public forays since departing the administration. She has delivered a number of private speeches around the country and is writing a book about her time at the State Department but offered little indication on whether she'll run for president again. She remains the heavy favorite within the party to succeed Obama and Republicans have begun dissecting her record. The conference was held in a hotel only about a mile away from Grant Park, where Obama delivered his victory speech in 2008 after a lengthy battle for his party's nomination against Mrs. Clinton and a general election against Arizona Sen. John McCain. The event in Obama's hometown drew a number of the president's allies, including Chicago Mayor Rahm Emanuel, a former White House aide under Clinton and Obama's chief of staff; longtime Obama adviser Valerie Jarrett and Lew, who served as Obama's chief of staff and also served in the Clinton White House. Later Thursday, the former secretary of state was being honored at a dinner with a Chicago-based non-profit organization founded by former Obama senior adviser David Axelrod and his wife, Susan, and other parents to promote research into epilepsy. As first lady, Clinton helped organize a White House conference on epilepsy in 1999. The event was another sign of approval for Clinton among Obama's supporters, with many of the attendees coming from the top echelon of Obama's financial backers.